English style street lanterns are an ideal post light to complement the design style of a stone English Manor style estate home as illustrated in the photo above (Post the Olde English design, and this charming style of street lighting can still be seen in historic areas today. At Lighting By Hammerworks our skilled craftsmen have mastered the art of handcrafting these graceful lighting fixtures incorporating the best materials and crafting techniques into each fixture. 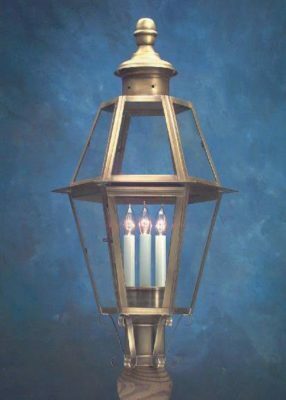 Create a lasting impression with Hammerworks English Street Post Lanterns Model 920P. First of all our skilled artisans handcraft these solid copper Reproduction English Colonial Post Lanterns with meticulous attention to detail. The result is exquisite quality & craftsmanship that is second to none. Notable details of the English Street Post Lanterns include the precisely formed top finials and the gracefully flowing post mounting “frog”. Furthermore the elegant four candle light cluster adds a formal and refined appearance. Most importantly you can choose from two sizes of this outstanding post lantern. In addition to the post mounted version we offer the matching English Style Wall Light 920W also in two sizes. 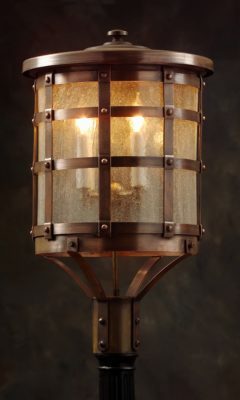 Another splendid collection within our Olde English Tudor Lighting selections are the outstanding English Manor Lights. Styles Encompass everything you need to complete your landscape design theme. Thus we offer Old English Manor House Copper Post Lantern 922P for your driveway or walkway. 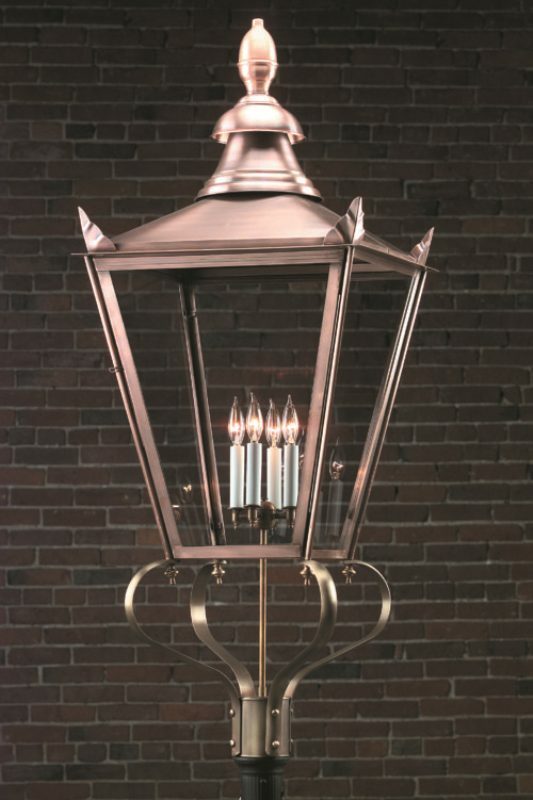 In addition the matching English Manor House Wall Lights 922W will light up your doorways. Finally if you need an overhead fixture English Manor Copper Hanging Lights 922H round out the series. If you’ve been searching for a unique style of superb quality lighting for your home, then consider Hammerworks exclusive selection of Tudor Style Old World Lights. This ruggedly handsome collection of solid copper light fixtures include Post, Wall, Hanging and Ceiling models in a variety of designs. We handcraft the Tudor Style Copper Post Lantern OWP1 in two sizes. The same holds true for English Tudor Copper Wall Lantern OWW1 which is available with or without the bottom loop. Finally you can choose either English Tudor Hanging Light Fixture OWH1 or Tudor Style Ceiling Copper Light OWC1 for overhead lighting. Details of this incomparable lighting include riveting which is the defining style, as well as hammer forging of the heavier metal pieces. In addition metal spinning the tops & bottoms, as well as the custom bent glass complete each piece.